Bradley Cooper’s directorial debut, “A Star is Born” proves how compelling a love story can be. This is is the third remake of the original 1937 “A Star is Born” with Janet Gaynor. In 1954 the story was told with Judy Garland, again in 1976 with Barbra Streisand, and now with Lady Gaga and Bradley Cooper. With the star-filled cast, the timeless story, and Cooper’s directorial debut, the newest version is much anticipated. Cooper’s rendition holds true to the original story, following a small town girl who becomes successful in the music industry. Returning fans will find what they are looking for and be pleased. The film is also entertaining enough to be of interest to new audiences and leave them satisfied in a movie experience. 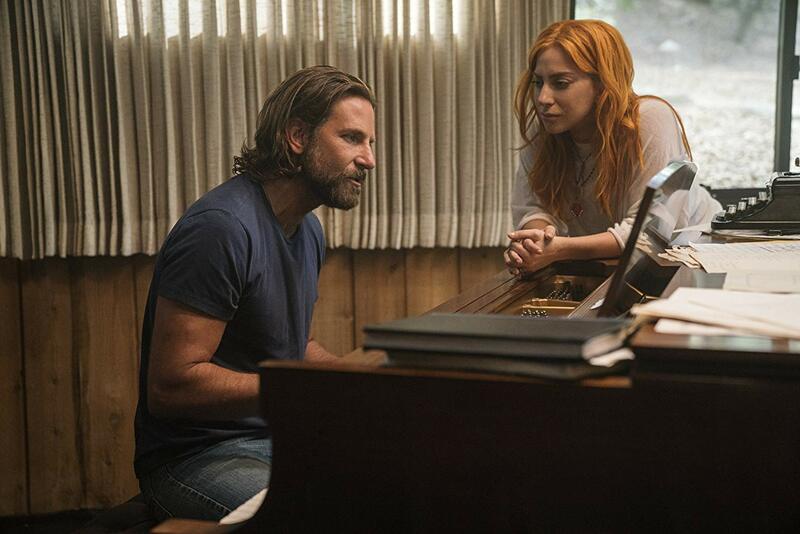 “A Star is Born” follows Cooper’s character Jackson Maine and his love story with Ally, played by Gaga. Their journey depicts not only a deep connection of love and music, but also how they endure hardships together. The film includes topics of struggle within families, substance abuse, the music industry and more, allowing the film to hold deeper meaning and intensity. Under the multiple layers this film develops, music is the core that guides both the story and the cinematic layout between scenes. Music is an expression of love and the foundation of Jackson and Ally’s relationship. Jackson is a well-known musician struggling in his fame. After Ally performs at a bar he visits, he is entranced by her voice and the way she sees music. The scenes that follow flow together in harmony, each one linked by another aspect of Ally and Jackson’s musical journey. There are many times in the film that the two main characters perform together for an audience. The live concert scenes were filmed in a way that transforms the movie theatre into a concert venue. Cooper’s directing makes it feel like you are in the audience, further drawing you into the film. The music is projected loudly, the bass pulsing with ashing lights from the stage. Both actors sang live during filming, creating a raw performance reflective of an actual concert. To see Cooper sing and Gaga act is an experience new for many audience members who are familiar with these stars in the opposite roles. Cooper’s musical talent is shocking. His pure and sometimes shaky voice is the perfect complement to his wholesome and rugged character. And yet the exciting reveal of his voice does not distract from his enticing depiction of Jackson. Cooper beautifully creates a complicated character who struggles to balance his love, passion and regret. Cooper’s performance is strong and worth the watch. He stands tall next to Lady Gaga, whose performance is just as powerful. Gaga presents herself in a way that has never been seen before. She plays Ally as a completely genuine and honest character. Her musical talent accents her acting performance to create a character that we all can relate to. The two make an intoxicating pair. Their onscreen chemistry was undeniable. The film is all about the characters. Cooper’s direction throughout the entire film includes artful cinematic choices, creating a beautiful yet raw atmosphere. The lighting and use of repeated close ups remind the audience to pay attention to the characters. Their relationship feels real and at times awkward and clumsy, quite different from the typical Hollywood love story. From the first few minutes of the film the viewer becomes invested in the characters and their story. Through success and heartbreak we feel their every emotion. It is easy to quickly fall in love with this story. From the cinematography to the performances and music, “A Star is Born” is elegant in a variety of aspects. With a combination of western soul and hints of French romanticism, this movie reinvents the musical love story. The star-studded cast delivers honest performances to present a timeless story in a new way.